I won’t comment. But if you’d like to vote on whether we should start the school year before or after Labor Day, please make your voice known! Aside from raffle prizes, kids activities, face painting, entertainment and informative workshops for parents, we are offering a free sandwich from Smoke Daddy’s who has generously supported our event. Thank you Smoke Daddy!!! You don’t want to miss this!!! I was really annoyed that this is what CPS decided to focus on for a survey when there are so many major issues they are ignoring. I know some people have really strong feelings about our start and end dates, but from my perspective, the real issues are class size, overtesting, and the mess we call “the budget”. Its like they are trying to pacify everyone with some teensy measure of control over something insignificant, all the while hoping no one will notice the entire ship is going down. Sheesh. I agree w/other issues being more pressing~but I’m hearing the turnout for classes b4 a Labor Day start weren’t good. I’m sure this is the way to go back to a start date after Labor Day w/Rahm saving face. I guarantee that 90% of kids getting high A’s feel the same way and that 90% of the kids flunking out say the blame goes to X-POTUS Bush and the CPS teacher. Oh, I almost forgot, possessing marijuana is also not illegal thus by default “not really bad” in bizarro world Chicago. Socialist-Democrats show their ineptitude with this survey. Senn High School’s faculty supports the Neighborhood HS Fair initiative. Unfortunately, we had previously scheduled our Community Open House for the morning of November 16 and are therefore unable to attend. On a personal note, I would have loved to represent Senn at the fair, especially as a show of solidarity with our sister neighborhood schools around the city. I hope the event is well attended and that visitors get to see the value of supporting our community schools! Can you define “socialist democrat” just so we know how you’re interpreting that? I just had a discussion with a friend this week about how the word “socialist” means different things to different people. Why can’t CPS stick to one calendar/start date for a few years before trying to change it again? No one will ever get used to the earlier start date if they give up after one year. That’s what they did last time, too! I have to think that the air conditioning situation may have had something to do with it. CPS is going to be lambasted every year when kids in the un-airconditioned (often lower income) schools sweat it out for a week or 2 in 90 degree weather. They want to change it back due to attendance or lack of air, but want to say that the parents wanted to do it. Seriously, CPS actually asks for parent input, and all people can do is complain about it? And, it was a simple, straightforward survey (not a push poll). Sheesh, people. Let’s save the complaining for later, if they refuse to release the results, or ignore them and do what they want anyway. You’re right, you’re right. I can’t shake the skepticism for some reason. I’m unhappy that they are considering making yet another change without giving it some time. Very happy they asked for parent input, but I wish they would try it for several years at least. The suburbs can do this every year, why can’t CPS? (Believe me, though, I understand about air conditioning since Lane only has a few classrooms with it). I prefer the earlier start/earlier end due to summer jobs. With the old schedule, kids I know lost out on opportunities to be things like lifeguards and camp counselors because they were still in school while private and suburban kids had been out for weeks. It is like when they keep changing the curriculum on the teachers every two years. It is like they think if they keep making changes it looks like they are innovative or something. They’re not. @11 last years schedule was only problematic because of the very late end date due to strike….then we started early. What I noticed because of the extended strike year was that many things for teens started around June 15 (when EVERYONE else was out of school) and we had finals week – including college enrichment programs at some of our target schools. Doesn’t look like that will be a problem this year with the early end date. My question would be if they start after labor day would we then end later (likely) it’s almost a trade off with air conditioning but a big difference in structuring the kids schedule. I like the more universal early start. This is our last year so won’t be voting – just something for the rest of you to ponder. I’m glad they asked; they indicated that school would go until mid June (I think 15 or 17 June) if we started after Labor Day. It was stupid to start school in Aug. We had two 96 deg. days that week. Unlike the other issues, this is something that CPS can actually change w/ little cost. For everyone who says that lack of A/C in 90+ heat is not that bad, I say, go volunteer for a day in a south-exposed room with 30 kids in those conditions. CB – yes this is what many say. Then why not let individual schools opt out of the early start due to A/C. I don’t know what the % of schools without is but why should all schools need to make adjustment for temperature sake. It would be interesting to see how many people would deal with the A/C issue if it means ending earlier. I think another factor was that many people who leave the country to go to Mexico did not return until after labor day. I think a few elementary and a HS on the NorthSide was affected, but I’m sure other schools felt the effect. This should be a reason for starting late? Ok, here’s what bugs me about it, now that I had time to think about it. It was a pretty big deal to shift the calendar. CPS has started after Labor Day for a long time and we know that there was a risk of losing funding if kids didn’t show up the first week and/or some families were traveling internationally (I’d assume over time they’d shift those travel plans.) It took a lot of effort to communicate to everyone that the schedule was changing and signaled (to me) a fairly major shift. The Track E was also done away with. Making a big change of any sort for CPS, I’d like to think that quite a bit of thought was put into that decision. So to then come back just 2 months later and be like “yeah, we’re thinking about maybe switching it back again” makes me wonder how well thought out the move was in the first place. And then makes me question other decisions — whether strategic thought is put into big decisions. If there were really good reasons for making that big change, how can it be so up in the air about switching back?! “This should be a reason for starting late?”~May be bc they lost money with kids not being their the first day. Also, I know many parents *in my area* that kept their kids home during the heatwave. Every time the Catholic schools near us closed (which were 3 days), we kept our kids home too. I know ppl won’t agree w/me, but I think after Labor Day is a better time, if there is no a/c. Isn’t the earlier start better for middle class working parents who pay for child care? (Ok, I know we are the minority in the system) I have always scrambled for child care with a post Labor day start. All the day camps are over, college kids are back in class, and HS kids activities/sports have started even if school hasn’t. It’s hard to find anything/one for elementary school kids. Some enterprising CPS HS kids should start a kid-sitting service for the last 2 weeks of August. Would look good on a college ap. Just my opinion: After Labor Day is better. Half our school didn’t have AC this school year start and they were all southern exposure rooms and the second floor was an oven. No teaching happened those days anyway- or let me say, a minimal amount. The kids were outside in the breeze and shade of the trees in the school yard or in our front garden to keep cool. They lost the majority of those days anyway so make them officially off. For us, later start is better because after we return from Europe, my kids won’t be jet lagged. If the park district knows the kids are starting later, they’ll adjust their calendar I would think for camp and things. You’re joking, right? Very little thought went into this decision. CPS did a survey with a series of confusing options in early Jan; the calendar was adopted at the Jan. board meeting. They did not publicly release the survey; you can ask for it, but it was never disseminated. They aggregated the student and parent responses but reported separately that parents accounted for only a third of the responses, which favored an Aug. start by a whopping 51%. The CTU-CPS joint committee that approved the final version met on 9 Jan., but the on-line survey closed on 11 Jan., so they decided before they knew the final results of the survey. In the parent “focus groups” — which were not true focus groups, just a bunch of parents called together at the last minute — two of the three groups preferred a Sep. start (I was called to take part in a focus group that had 13 open slots at the time, with less than 48-hours notice; no one was screening the group). Why was an Aug. start an option at all? Look at how Track E was done away with. Does any know of any study of how Track E did? Was there any public statement about why track E was not kept? No. @14 Zoned HVAC for a school — which is what you need to do to A/C it properly (e.g., north side needs less cooling; south side needs more; vice versa in the winter on heating) to cover classrooms, halls, and common spaces — is very expensive (six-figures at least). Most of the schools are not classic schoolhouse that were designed for the lack of A/C — 12-14′ ceilings with fans, classroom doors to the halls with windows above them to vent air into the halls, and top and bottom opening exterior windows, large attics to separate the roof from top-floor ceilings ; instead, most have 9′ ceilings, external casement windows that only partially open at the bottom, no attic, and doors without vents. What I found amusing last year is when the new calendar was released, it had Thanksgiving break on the wrong week. Then they had to release a corrected calendar. It made me wonder how many people at CPS looked at that calendar prior to release and not one person thought to go to Google to confirm the dates for Thanksgiving? To me that summed up CPS and how much thought and effort goes into decisions that affect thousands of kids. Very little. P.S. I voted for after Labor Day start. That last week of August is great to go to Great America. Or museums if you prefer. Or take a vacation as most of America is in school. @26: That’s so funny. My husband recently discovered he booked our Thanksgiving vacation for the wrong week and blamed the CPS calendar. I thought that he was just making excuses for his mistake 😉 Meanwhile, it cost us a fortune to change flights. Boo, CPS, and yes, so typical! @pantherparent – I like have that last week free when everyone else is in school. Now ask me if I’ve ever actually done any of those things we my kid! He always wants his last hurrah of “doing nuthin.” But I like knowing we *could* go to every museum in the city and disneyworld. I’m thinking that it may be easier to get kids started earlier than it is to keep kids motivated to study in June. By the end of the summer my kid was really ready to go back (he would never admit to it) since some of his friends were already in school and I don’t know of any park districts that have any day camps in August. Following up on what CPSO says @17 about decision-making at CPS: That’s the funny contradiction I’ve notice about CPS while observing it now for 13 years. It’s a huge system with hundreds of schools serving hundreds of thousands of students. You’d think that the entrenched ways would be rock solid, like an old-school investment bank that reluctantly adopts new-fangled technology and ways of thinking. However, I’ve found the opposite seems true, and CPS/city leaders have always been ready to leap onto the new idea, whether it’s magnet schools, charter schools, year-round calendars, pre-k offerings, “autonomous schools”, new tests, Common Core, free breakfast, etc etc. This is not a bad thing. It’s just that one size doesn’t always fit all, and it’s one thing to latch onto an idea that sounds good, but another one to think it through thoroughly, and even harder to consider all the other ramifications of the decision. So it seems like it’s often a matter of “why not? let’s give it a go” and then if it doesn’t work out, try something else. This leaves some of us exhausted, but at least it gives us new material to obsess about, LOL. I spit my coffee out at your post. Super funny. And not. Its like all the tests they just added this past month for 3-8. Next year it will be something different. Heck, we had 4 different directives regarding these benchmark assessments in 2 days. CPS=where they think educational whiplash is innovation. Someone should do a study on how many reading programs CPS has adopted in the last thirty years-listing type of program, length used, success or lack of and most importantly, who made money on the program. The later start date would not be good for students taking AP classes. They will get less instructional time (compared to their suburban peers) before their AP exams. If the post-Labor Day start date is used, I estimate they will receive about 2 weeks (maybe more) less instructional time. This seems very inconsistent with the CPS rhetoric about every student demonstrating college readiness. @32. Veteran: I would like to see the same study for math programs. My kid still hasn’t learned anything new in Everyday Math this year. Agree with friend. It seems like the earlier start is better for parents but the later start is better for students. The ap issue affected us. Not fair. Also agree that child care was not available in the last two weeks of August because cps is one of the only school districts to have this late start. How can the suburbs and private schools do this but we can’t? Is it just air conditioning? How about stopping with the one size fits all ways of cps? #34 I agree with you although CPS chooses a reading program/approach for all the grammar schools. CPS has a long list of reading programs-so long it is mind boggling. Unlike the CPS “mandated” reading program,grammar schools were allowed to choose the math program unless they were on probation. There is a clause in the CTU contract that stipulates that each school will have a textbook committee-this is where the teachers schedule textbook company reps to present their program to the entire staff. The textbook companies also send in samples of their textbooks so that the staff including sped and support staff at each grade level can see the actual materials not just a representative page in a brochure. The textbook committee then can draw up a rubric and have the teachers rate each textbook, then they can make the textbook committees choice known to the principal. This is how is it supposed to work-for various reasons, the textbook committee is often non-existent or ineffective. As far as the Everyday Math, I did review math textbooks when my school changed texts and none of us who reviewed Everyday Math recommended it although I will say none of the math texts impressed me. I have a gen ed and a sped background and Everyday Math relies too much on reading skills-impacts the LD and ELL populations, there is not enough practice, and the directions are often confusing (written by math experts not by grammar school math teachers?) I understand the need to apply computation skills to word problems but the new math textbooks assume prior knowledge and are often so “sketchy” that the teacher must supplement with other/older math materials. Parents have complained to me that they don’t understand the directions/explanations. The part that I found most disturbing about these texts was a that new teachers may not know how deficient these texts are until the school year is over. Many suburbs jumped on Everyday Math in the 1990’s and were forced to drop it. CPS should have researched this before they jumped on Everyday Math as the magic bullet. Aside-it has always amazed me that children who transfer into CPS from the Catholic school system can read and write well (unless they are sped) and yet the Catholic school system doesn’t change reading programs every time a new CEO takes over the system. CPS needs to look at the neighborhood schools with high scores and determine which materials are being used and analyze that information. Now you’re talking. Follow the money. …..and now the survey is “closed”. Really? How long was that survey period?? Any idea when we are supposed to know the results? Or when CPS will announce the 2014-2015 calendar? My kiddo’s school suffered through some sweltering days this past August. Would’ve helped a ton if they had started after Labor Day. The Neighborhood Schools Fair looked to be a great success. The planners really did a wonderful job of representing schools from all over the city, and each school I talked to had an enthusiastic group of parents or staff on hand to speak about the merits of their school. Preschools through high schools were present, so there was something for every family. Great food from Smoke Daddy, too! I think this will be a wonderful annual resource for many families who want to explore their neighborhood school options. Many thanks to the neighborhood parents who brought the event together. It’s a huge undertaking but well worth the effort! I think those of us posting here spend a lot more time thinking about everything than CPS does! That’s evident by all of the constant changes. I’m sorry you kids were sweltering. We kept our kids home during the heatwave and regardless when CPS starts, if it’s too hot, we’ll keep them home again. But I’ve heard a lot has to do w/the kids being out of the country. I hope it’s an after Labor Day start. I don’t understand why people who leave the country can’t just come back a week earlier? They don’t come back a week earlier because the cost of tickets are so much higher. We have many students at my school who leave before the school year is finished and arrive back after it has started. we voted for after labor day, because it was pretty silly to begin school and then BOOM – a three day weekend, which breaks up the beginning of the school year, and they have to almost start again. OK, I’m not going to blow off peoples’ concerns as some sort of “white people’s problem” whereby they don’t know when to come back from Harbor Springs or grousing about when to let the recent- Oberlin-grad nanny plan her visit to see friends in Brooklyn, etc. —I can’t stand when people do that, considering 99.5% of CPS families do not fall into that category. We’ve all got kids, jobs, limited finances, people that help with kids that need to know how to plan their own lives, etc. Most of us have limited vacation time, in terms of actually planning for both adult partners (or just one person in the case of single parents) to take off from work at the same time, visiting cousins before they start school also, planning summer camps, etc. Not knowing when CPS will start really is kinda’ a big deal, in many cases. That said, the 15-30k (of after-tax income) we’re saving PER CHILD in tuition, depending on which private school we’ve rejected for zero-tuition CPS options, kinda’ makes me not so angry about all this. OK, maybe we’ll have to pay a little more for the all-inclusive, vs. the rate the no-change, discounted, week before Labor Day if we paid 8 months ahead, etc. At least CPS is trying to take parents’ feelings into account, I’m pretty sure now that ALL of CPS is on the same schedule, things will be pretty regular (either pre- or not-pre Labor Day) from here on out. In either case, I’m just thrilled not to be paying sky-high tuition or sky-high suburban property taxes, so it’s all good, relatively speaking. What I’m saving can be used toward a family vacation. klm – in our 80% Hispanic, 85% free/reduced lunch, 8% white neighbhorhood school…. it’s the travel to mostly Latin America/Mexico that our population is embarking on. No Brklyn visiting-Oberlin-nannies at our school. Just plain old summer vaca with Grandma/pa, cousins stuff south of the border. My bad assumption was that most schools have that kind of travel. @47, our students are in the same position. Most travel back to Poland or to Mexico. I agree. At my school, it’s either to Poland or Mexico and it all has to do with the cost of the plane tickets. That’s what parents have told me. I agree that the last few days of school in June are pretty lax, but the first day/weeks of school are crucial! Some don’t care. @50 Not trying to argue with you but seeking clarification. If the child was in private school would you not still need to pay for before and after care on top of tuition? Also, are you referring to parochial school or private? Usually the tuition difference is quite significant between the two. Just trying to understand exactly what you mean when you say you are paying the same as if the child were in private school. Wait a minute here, CPS is about half AA and half Latino with about 6% Caucasian. Of the Latinos many can’t travel back and forth so the percentage that has the means to go on extended vacations must be relatively small. The number of Poles is relatively tiny and shrinking rapidly. Granted, there must be concentrations of these delinquent travelers in a few schools here and there but it doesn’t make sense that this issue should drive policy. If it does, shame on CPS. I wanted to vote, but didn’t have my child’s ID with me when I first looked at it and then the survey was closed when I went back to it! Aside from this site, I would have never even known about it – was it sent out to CPS parents and I just didn’t get it? That said, I would have voted to start before Labor Day; I always started before Labor Day when I was a kid so it doesn’t feel odd to me and I think it is better to get out earlier in June. Also, when I looked at the two calendars, the one starting after Labor Day had more weird months with some random short weeks – November looked particularly odd again. I hope as people made their choices they looked at the whole calendar and not just start and end date. As a working parent, start and end is important but I also am looking at where will I need to find alternative care throughout the year for other off days. one poster claiming tuition savings by choosing CPS; one poster still looking for ‘free’ school; one poster insinuating that there is priviledged, recreational, luxury travel choices made by CPS parents; another arguing that any travelling families is a small percentage of the whole pop. Maybe that’s part of the big district challenge; it looks/feels different throughout the city…. One size doesn’t fit all. Agree with New to CPS. The late start calendar was terrible with scattered days off which makes it difficult for kids to learn. The early start had more consecutive days off which makes it easier for child care or an option to take a quick trip if you have the money for that. @56 agreed. We have a large Latino population at our school yet no one would consider missing the first days of school for any reason other than illness. A poster comments on the advantages of an early start for AP students. This plus the idea that the beginning of the year is more productive than the end of the year should give pause for consideration. Should we have different start times for HS vs. elementary? SEES and magnet vs. neighborhood schools? If we need to make special allowances for schools that by want or need have a more seasonal agenda then maybe that’s the way to go. Catholic grade school started at 8 a.m. w/ afterschool care until 5:30. CPS public grade school started 8:45 and out around 2:30, which required before- and after-school care with busing. Same price for each scenario! The busing part of the before/afterschool program. The busing was needed for the hours (the short school day) that don’t work well with 9-5er parents. I say start early, get out early. Over time, people will make the adjustment. The problem is lack of consistency as another poster mentioned. Nothing ever stays in effect long enough in CPS for people to adjust. Those that travel will begin to understand that it’s important to be in school right from the first day. I think it’s great that all schools are on the same schedule. So much easier for parents with children in different schools. So much easier to schedule professional development. OK, I know this is off topic, but was anybody else at the meeting at Lincoln last night (for CPS Facilities’ presentation about the new addition)? I swear on my life, I’ve never seen anything like it. There were protesters outside with placards and chants, shouting, uncivil behavior, etc., by people against it. Well, OK, it’s their right, etc. However, they entered the auditorium in unison and shouted and chanted in an attempt to prevent any presentation, several shrill individuals screamed constantly –you would have thought somebody was discussing the tearing down of an ancient, historically significant shrine to put up a gas station, not the much-needed fix for an over-crowded public school. I’m not being dramatic –it really was like that. Oh yeah, one of the anti-new annex men actually started punching another man and the police had to secure the area –that’s how heated it became.. I live in very close proximity to Lincoln. I have to deal with the traffic during the after-school period, people blocking the alley so I can’t get into the garage, etc. That said, I genuinely don’t understand how a new addition (using CPS/school property) will in any way truly affect the quality of life of those that want to prevent it. I mean, we’re talking about a much needed addition to a a hugely successful neighborhood public school (an essential public service) using its OWN property to enhance the education it provides, with gambling proceeds from the state, not local taxes. There was a woman who bought one of the houses (with no parking) DIRECTLY ACROSS THE STREET from Lincoln a few months ago, shouting and complaining about how (I’m living on the same block, so I’m not sure what she’s talking about) the new addition will make it even harder to park…..huh? It’s kinda’ like somebody buying a house next to O’Hare and then complaining about all the noise from airplanes and demanding from the city that United reduce the number of flights. Yes, like at just about every school, there are a few inconsiderate parents/people that block alleys, etc., during pick-up, etc. but Lincoln’s principal is very clear that parents need to respect Lincoln’s neighbors and will (and has) let people know how inconsiderate they’re being, how bad it makes the Lincoln community llook, etc. There’s one anti-new-addition person in particular (anybody in the know will know who I’m talking about) that in the discussion period at the gym I heard inform Lincoln’s principal, “I’ll will be laying down in front of the bulldozer if you go through with this” –and I’m sure she was serious. It’s really hard, because the loudest, shrillest people are all my neighbors. We usually have a holiday party for the block, but I’m afraid to see them this year. For real. We started discussing it here and I’ve made a new post, just since we rarely get anything this Jerry-Springer-like to discuss. I don’t mean to belittle it. I’m all for communities coming together to fight for what they believe it. There are just some gawker-like elements to this story that are hard to ignore, though. How did you all feel about your children having the Wednesday before Thanksgiving off? I imagine it was a child care issue for some parents who had to work Wednesday. I loved this extra day off before Thanksgiving !!! I think is way better than having random day off in the middle of the school year. Mama 67, I agree. Kids helped get ready for Thanksgiving! Days off next to each other make so much more sense. Loved it! Made travel sooooo much easier! All the parents I know (and probably their kids) loved it!!!! As a teacher, I loved it too! Even though it was a “no pay” day, it was wonderful to have the day off! The only thing that will be tricky is we start with our all important MPG testing on Monday. Nonetheless, glad we had the time. I didn’t even give any homework so the kiddies could enjoy family time. There’s enough day to day pressure to succeed that “letting go” a bit felt great. Students, Parents, Teachers & Staff, The Board of Education has amended the School Calendar to allow for Parent-Teacher Conference Day in the Spring to be held over two days instead of one: April 7 for Elementary Schools and April 8 for High Schools. The change means that the LSC Elections will be held on April 7 for Elementary Schools and April 8 for High Schools. Please plan accordingly. i did find one small benefit to having both the elem. & HS conf. day the same…. our HS sitter was able to earn some money & sit while we went to conferences for the little kids. Thanks~I hope our school updates us soon as well. I had heard many schools reported parent low turnout~probably parents couldn’t get to 2 or more schools in one day. I’m just gonna ask it again – any word on the outcome of the survey or whether or not the start date will change? Haven’t heard regarding start date, but this year’s calendar might change. Instead of tacking the snow days on the end, I’ve been hearing our staff PD days, which used to be non-attendance for kids, will now be instructional days and the PD days will switch til end of the year. This is info I got per my union rep., we’ll see what actually happens. Just saw the newly approved calendar for 14-15. Its weird. We start after Labor day, there’s an 8 day winter break, then a 5 day break in February, some half day PD’s, and we go until nearly the end of June. I was glad to see that the first 2 days of school for kindergarten will only be half days. Imo, kids REALLY need that to adjust. So, I like that. But overall, the calendar just seems strange to me. Such flip flopping in terms of start dates and the half days that are scattered throughout the year. And December 22-23? Maybe I’ll be proved wrong, but I would imagine tons of students and staff will be absent those days. Never mind. 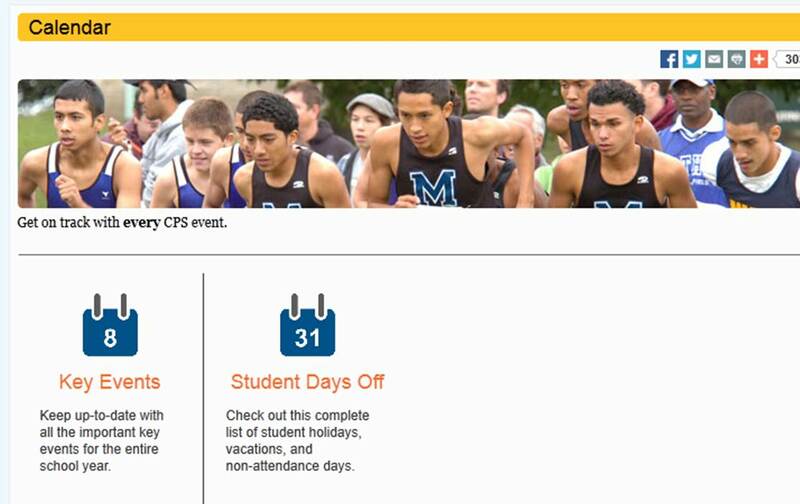 CPS made a major mistake AGAIN and sent out an incorrect calendar to all school staff. Gotta love central office! your seful info. Thanks for the post. I’ll definitely return. I know I am getting experience evwryday by reading thes fastieious articles.